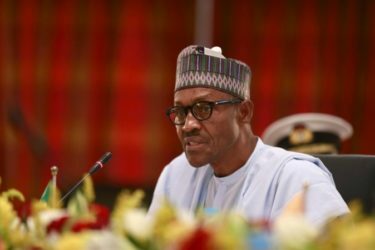 (Compiled from Reuters by Felix Onuah, with UK Daily Mail and NY Post) – ABUJA — A group of 82 schoolgirls held captive for three years by Islamist militants met Nigerian President Muhammadu Buhari in the capital Abuja on Sunday a day after they were released in exchange for several militant commanders, officials said. The girls were among a group of 276 schoolgirls kidnapped in April 2014 by the militant group Boko Haram, which has waged an eight-year-old insurgency to create an Islamist caliphate, killing thousands and forcing more than two million from their homes. On the night of April 14, 2014, Boko Haram fighters stormed the Government Girls Secondary School in the remote Nigerian town of Chibok and kidnapped 276 girls. 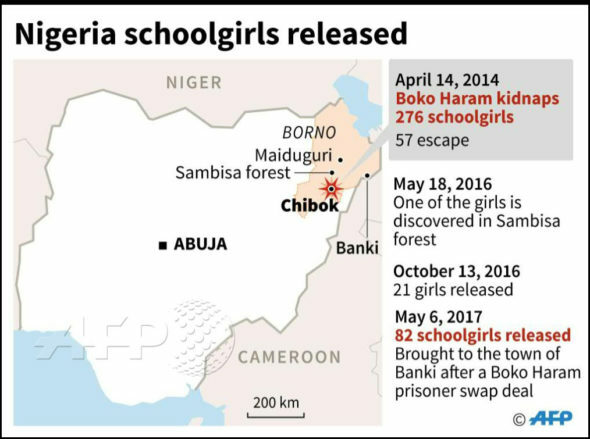 21 of the Chibok schoolgirls were released in October 2016. Before Saturday’s release, 195 of the girls had been captive. Now 113 of the girls remain unaccounted for. The mass abduction shocked the world and put tremendous pressure on Nigeria’s government to counter the extremist group. The International Committee of the Red Cross (ICRC), along with the Swiss government, mediated months of negotiations between Nigeria’s government and Boko Haram for the release of the 82 girls. A military source said five Boko Haram commanders had been freed in an exchange, but declined to give further details. He also said the newly released girls soon would meet with their families. Photographs released by the ICRC showed a line of girls wearing vests emblazoned with the charity’s logo waiting to board a military helicopter. The military source said the girls had been flown from Banki near the border with Cameroon to Maiduguri and then Abuja, where they first got a medical checkup at a police hospital before being driven in two buses to the presidential villa. Their meeting with the president apparently took place before they were reunited with their parents and relatives. In Chibok, the remote town in northeastern Nigeria where the girls were abducted from, families were nervously waiting for names of those freed to be published. Many of the captive girls, most of them Christians, were forced to convert to Islam and marry their captors. Many of these gave birth to children in remote forest hideouts without knowing if they would see their parents again. It is feared that other girls were strapped with explosives and sent on missions as suicide bombers. The army has retaken much of the territory initially lost to Boko Haram, but large parts of the northeast, particularly in Borno state, remain under threat from the militants. Boko Haram suicide bombings and gun attacks have increased in the region since the end of the rainy season late last year. On Friday, the United States and Britain issued warnings that Boko Haram was actively planning to kidnap foreigners in an area of Borno state “along the Kumshe-Banki axis.” That’s close to where the Chibok girls were reported to be found. Compiled/adapted from news reports at Reuters, UK Daily Mail and NY Post. Reprinted here for educational purposes only. May not be reproduced on other websites without permission. UPDATE: Parents of the missing Chibok girls are slowly learning if their daughters are among the 82 freed by Boko Haram militants in Nigeria two days ago. The girls’ names were put on Twitter by the president’s office on Sunday after they were flown to the capital Abuja to meet President Buhari. On Monday, families were checking the newspapers to see who was on the list and decide whether to make the long (almost 500 miles), dangerous and expensive journey to Abuja, according to the Associated Press. Even parents in Abuja – where the 82 girls were flown in order to meet President Muhammadu Buhari before he left the country for medical treatment – were waiting to see if they would be reunited with their daughters. Esther Yakubu told the BBC the last three years had been a “horrible nightmare” but that even the possibility of her daughter having been rescued was giving her hope. NOTE: Read “Background” and watch video under “Resources” below. 3. a) How many schoolgirls were kidnapped from their school in Chibok by Boko Haram militants three years ago? b) How many are still held captive? 4. What religion were most the the kidnapped girls? 5. Where were the girls brought upon their release after 3 years? 6. Were these schoolgirls the only people kidnapped by Boko Haram? Explain your answer. 7. a) Why do you think many of the parents did not go to Abuja? 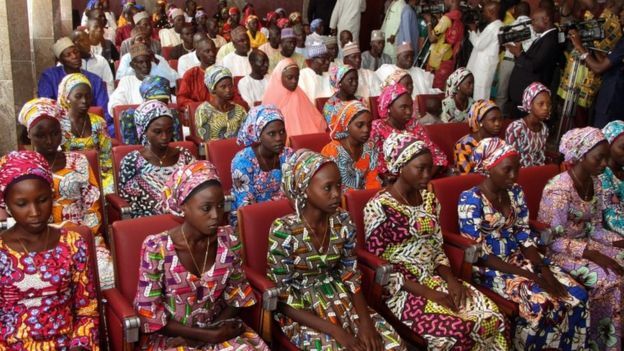 b) What should the Nigerian government have done immediately for the parents of the freed girls? 8. What do you think of the government’s decision to bring the freed girls to the capital to meet with the president before being reunited with their parents? 9. Many of the girls had babies with their Boko Haram ‘husbands.’ There were numerous media reports on their release, with no mention of these babies. Why do you think the media did not mention the children in their reports? Boko Haram, which means “Western education is sin” or “Western education is forbidden” in the Hausa-Fulani language, has launched a self-described “war on Christians” and seeks to impose a strict version of Sharia law across northeastern Nigeria, if not the entire country. It has attacked various targets in the West African nation since its formation in the late 1990s, according to the U.S. National Counterterrorism Center. This includes killing and kidnapping Westerners, and bombing schools, churches and mosques, the center said. In November 2013 the U.S. State Department designated Nigeria-based Boko Haram and its offshoot Ansaru as “terrorist organizations,” legally enabling Washington to take various steps against the groups, their members and their supporters. The two groups join a State Department list of “Foreign Terrorist Organizations” that includes al Qaeda, Hamas and many others. Being so named means the U.S. can freeze such organizations’ assets, impose travel bans on their known members and affiliates, and prohibit Americans from offering material support.